It's that time of year again! The BabyTime Show will be opening its doors once again this year for thousands of mommies and daddies, grannies and grandpas and of course, babes and kiddie-winks. I've been going to the show since I was pregnant, so this will be my 5th show! 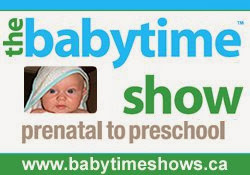 As the tagline reads, the BabyTime Show is good from prenatal to preschool; I still learn so much when I visit and each time I've gone, I've had new questions and new experiences. The bi-annual show takes place at the Metro Toronto Convention Centre, North Building in the fall (it take place at the International Centre in the Spring), and in addition to the free parking, guests can guarantee a great day - shopping galore, wonderful shows and informative presentations, entertainment for the kids, samples, coupons, oh, and did I mention shopping?? This season's show runs Friday, November 8 through Sunday, November 10. Another cool thing? The BabyTime Show supports The Diaper Bank, a charity that collect loose, open and new packages of diapers and distributes them to those living in poverty in the GTA. What an important cause; to think that some families can't afford diapers is heartbreaking. You can bring your diapers directly to the show to make your donation. Simply Suppa is very fortunate to offer readers the ability to win up to 7 prizes, courtesy of The BabyTimeShow! We are raffling off 6 pairs of tickets to the show and this wonderful prize pack full of Play-Doh and My Little Pony treats! For those who win, or those going to the show, don't miss MY LITTLE PONY LIVE: November 8, 9 AND 10th at 11:30 a.m. and 1:30 p.m. You can go early and visit the Play-Doh Play Centre too! For your chance to win, enter the Rafflecopter below and good luck! See you at the show!